Frank, Fritz, and Mike are joined by some friends and family at the Hard Rock Cafe in Cleveland, Ohio after FPB's performance in Euclid, Ohio on November 27th. 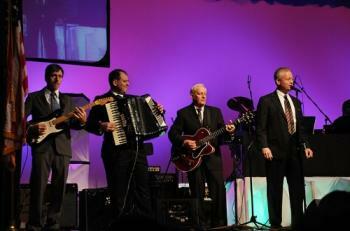 Frank, Fritz, Tom, and Mike (hidden by special guest vocalist, Dale Bucar) perform during the Cleveland-Style Polka Hall of Fame Awards Show in Euclid, Ohio on November 27, 2010. Mike, Frank, Fritz, and Tom pose for a picture before heading off to perform at the Cleveland-Style Polka Hall of Fame Awards Show on November 27, 2010. Members of Fritz's Polka Band are pictured here with Walter Ostanek (left) and Joey Miskulin (right) at the conclusion of FPB's gig on November 26, 2010 in Cleveland, Ohio. Frank takes lead vocals on a tune while Walter Ostanek and Fritz jam along during the Fritz's Polka Band gig on November 26th in Cleveland, Ohio. Fritz is all smiles as Walter Ostanek plays a tune on Fritz's button-box accordion during FPB's gig at Tony Petkovsek's Thanksgiving Polka Weekend on November 26, 2010 in Cleveland, Ohio. Mike and Tom are pictured here during the Fritz's Polka Band gig on November 26, 2010 in Cleveland, Ohio. (Photo courtesy of Michael Allen Blair) During a break between songs, Fritz exchanges pleasantries with Joey Miskulin, during FPB's gig on November 26th in Cleveland, Ohio. (Photo courtesy of Michael Allen Blair) Fritz and Tom are shown here with Ronnie Sluga (banjo) and Joey Miskulin (accordion) during FPB's gig at Tony Petkovsek's Thanksgiving Polka Weekend on November 26th. Mike and Fritz are pictured here with Tony Petkovsek during the FPB room party on November 26, 2010 in Cleveland, Ohio. 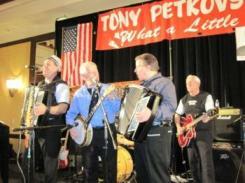 Tony had FPB take part in his polka weekend. Fritz is shown here during the FPB room party on November 26th with his friend, Kelly Murer, who went on the FPB bus trip to Cleveland, Ohio. Fritz is pictured here passing out shots of Jager punch on the FPB bus ride to Cleveland, Ohio for FPB's gig on November 26, 2010.